Horton: [thanking people] And Morton, for being the only one who stood by me. Well not right by me; he hid in the bushes sending me good thoughts. He's small. Morton: Dude, you are a warrior poet. 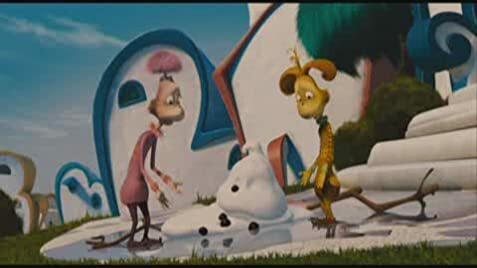 Q: Is the Whoville in this film the same as the Whoville in How the Grinch Stole Christmas? Q: What are some differences between the film and book? Q: What is the mayor's actual name? There is a world out there that if you haven't heard of it, you're not a kid or never even *been* one. A world of insane imagination and the most creative ideas imaginable, told in the form of wacky but forever appealing poetry-style story-telling. This is the world created by Dr. Seuss, possibly one of the most iconic children's authors of all time. But his stories are in an odd place as of late, as the world of Hollywood looks up to his stories for inspiration on new movie projects. The first one was carried off well ("The Grinch"), but the next one didn't ("The Cat in the Hat") but there was still something missing to make these adaptations just right and that was to give up doing live-action and do it in animation, where practically anything could happen without as much pressure to make as live-action movies would be so to hear (pun unintentional, title's pun is) about "Horton Hears a Who" being an animated production, unlike these two movies, naturally I was very excited to see the end result. Now, I have just yesterday so off I go with a review! The first thing that really struck me with this movie, which is also the best thing about it overall, was the animation. 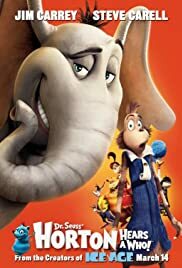 Blue Sky Studios, the people behind the "Ice Age" trilogy (third movie in production) are a trustworthy studio when it comes to making some really delightful and appealing pieces of CGI but with "Horton", they seem to have outdone even what they themselves thought about their talents! Without exaggeration, the animation is effortlessly stunning through and through and remained absolutely true to Dr. Seuss' playful and appealing drawing style as well as putting in a few new things that don't get in the way. In short, the animation *alone* is a good enough reason to see the movie, hands down. There are added characters in the movie that weren't from the original book but pretty much all of them are not a nuisance and don't get in the way of the storyline so no one should worry, even if a lot of them don't add much. As for the original characters themselves, they are portrayed as they should be and any change to the characters is not easy to notice which is good enough. Original story itself is adapted and carried off well and isn't spoilt by anything else in the movie. The back story of JoJo and the Mayor's relationship can feel a little odd at first but they've managed to blend this well with the original story and it's easy to get used to after a tiny amount of time. The movie's most obvious problem however is that it does tend to focus heavily on humour in a lot of scenes and there are too many jokes that aren't really necessary, a few of them will sadly even date the movie in coming years (I won't say which ones they are here, you have to see for yourself) but thankfully the story manages to stay intact still and besides, there is quite a lot of jokes (that had a purpose) that were really *hilarious* so it's not a total disappointment. As for Jim Carey and Steve Carell? Well, they could have been better but they were good enough for me to say that they were good choices. So overall, "Horton Hears a Who" is a good enough effort from Blue Sky Studios and good enough for me to say that it's a decent film. Really could have done without so many unnecessary jokes but the animation and good story adaptation make up for it. Worth checking out! I rate this: 6 out of 10.